He-Man has quite possibly the best resume out there. The first (and only) job he's got listed on it is "Master of the Universe," which gives him power. And boy, does he have a lot of power. So much power in fact, that the adventures of he and his cohorts have merited the attention of fans both young and old. Those same fans now get a chance to lavish even more attention on him, as the Dark Horse and Mattel art book The Art of He-Man and the Masters of the Universe will receive a limited edition release in 2015. Restricted to 4,000 copies, The Art of He-Man and the Masters of the Universe Limited Edition comes packaged in a deluxe Castle Grayskull slipcase, with an exclusive foil embossed cover and portfolio print, coming in at just under 400 pages with commentary written by Tim & Steve Seeley. The Art of He-Man and the Masters of the Universe includes rarely seen images of concept sketches, prototypes and more from Mattel’s archives. Featuring beautifully restored art from master illustrator Earl Norem—celebrated artist of the most memorable He-Man images, interviews with Dolph Lundgren, Paul Dini, Erika Scheimer and many more. FOR IMMEDIATE RELEASE: Milwaukie, OR – Just in time for fans’ holiday wish lists, Dark Horse and Mattel announce that the biggest art book of 2015 - The Art of He-Man and the Masters of the Universe - will receive a limited edition release. 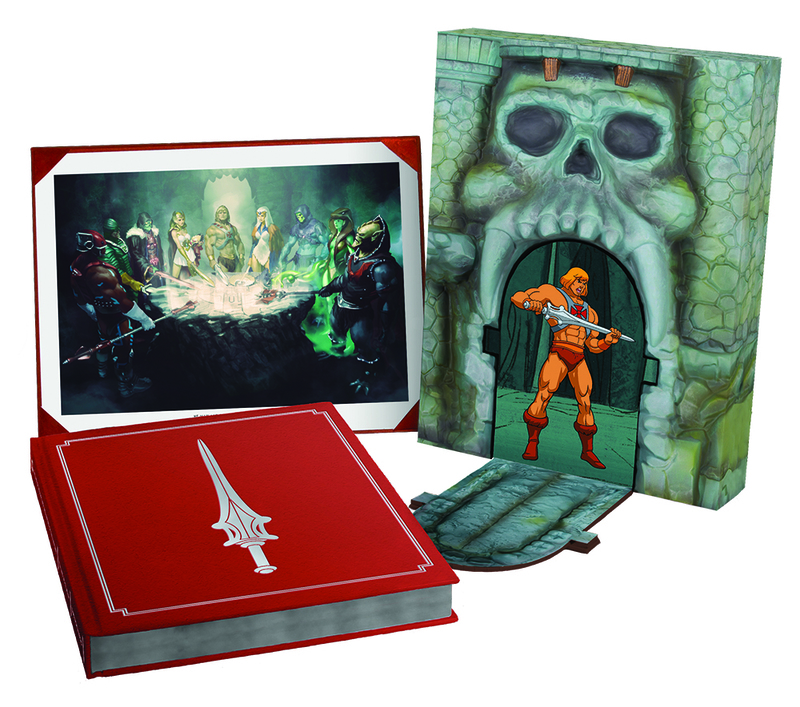 Restricted to 4,000 copies, The Art of He-Man and the Masters of the Universe Limited Edition comes packaged in a deluxe Castle Grayskull slipcase, with an exclusive foil embossed cover and portfolio print, coming in at just under 400 pages with commentary written by Tim & Steve Seeley. In 1982, the world was introduced to He-Man® and Masters of the Universe®. What followed was a cultural sensation that changed the landscape of children’s entertainment forever! Join Mattel and Dark Horse in this comprehensive retrospective chronicling the decades-long epic journey of He-Man from toy, to television, to film, to a true pop culture phenomenon! The Art of He-Man and the Masters of the Universe includes rarely seen images of concept sketches, prototypes, and more from Mattel’s archives. Featuring beautifully restored art from master illustrator Earl Norem—celebrated artist of the most memorable He-Man images, interviews with Dolph Lundgren, Paul Dini, Erika Scheimer, and many more! Founded in 1986 by Mike Richardson, Dark Horse Comics has proven to be a solid example of how integrity and innovation can help broaden a unique storytelling medium and establish a small, homegrown company as an industry giant. The company is known for the progressive and creator-friendly atmosphere it provides for writers and artists. In addition to publishing comics from top talent, such as Frank Miller, Mike Mignola, Neil Gaiman, Brian Wood, Gerard Way, Felicia Day, and Guillermo del Toro, and comics legends, uch as Will Eisner, Neal Adams, and Jim Steranko, Dark Horse has developed its own successful properties, such as The Mask, Ghost, Timecop, and SpyBoy. Its successful line of comics and products based on popular properties includes Star Wars, Mass Effect, Buffy the Vampire Slayer, Aliens, Conan, EVE Online, Halo, Serenity, Game of Thrones, and Domo. Today Dark Horse Comics is the largest independent comic book publisher in the US and is recognized as one of the world’s leading publishers of both creator-owned content and licensed comics material. HE-MAN, MASTERS OF THE UNIVERSE and associated trademarks and copyrights are owned by, and used under license from Mattel.